Lawyer Raymond Nesbitt briefly explains how to go about legalising unregistered property extensions and the consequences of not doing so. Often, with a view to sell, property owners decide to make improvements or extensions to their Spanish properties to make them more attractive to prospective buyers. Adding an outbuilding in the garden next to the pool, adding a few additional guestrooms, adding a toilet, building a cellar with home cinema or an in-door heated swimming pool all sound harmless and like a great idea on paper. Surely these improvements add value to the property, making the prospect of selling them far easier, yes? The fact of life is that if these improvements are not carried out following the correct legal procedure they may become a perfectly good waste of money or even be counter-productive to selling your home. In this article, I explain what are the legal consequences of unregistered extensions and how to go about legalising them. There are several risks associated, with varying degrees of importance, of not following the statutory legal procedure; I will list them as bullet points. You can be fined. Should your town hall catch you undertaking non-sanctioned improvements on your home you can be heavily fined and even be required to pull down the improvements at your own expense. You may be criminally prosecuted. You may even face the daunting prospect of a State prosecutor instigating criminal proceedings against you dependent on the illegality committed. This is particularly true of rural property. Please read my article on the matter: How to Buy Rural Property in Spain. You may be forced to pull down the improvements at your own expense. Unregistered extensions are uninsured. Should they collapse, you have no legal recourse against them. Legal extensions will be covered by insurance. You can´t borrow money against the improvements on the property (or not enough money). Should you require to raise capital to face medical treatment, for example, a lender is going to offer you significantly less money if you have not registered the extensions or improvements made to your property. Unregistered extensions at the Land Registry do not exist legally. This has very important practical consequences, particularly on selling a property. In other words, only accurate property descriptions matching reality at a Land Registry are deemed legal. This translates in practice into significantly reducing the pool of buyers for your property, something nobody wants; more so on a challenging sales environment. Most buyers require finance to acquire a property (i.e. mortgage loan). Lenders will offer borrowers considerably less money to acquire a property with non-registered extensions as these are non-existent for all intents and purposes. Making it easier on us, let us examine it with a practical example. If a rural property is being sold with a modern two-storey villa of 450 m² in a plot of 10,000 square metres (€1.5mn) albeit on paper (Land Registry description) it is actually a vintage cortijo of 80 m² (€120k), a lender will only be able to finance a fraction of the asking price. Meaning a buyer will be facing a huge shortfall in the money required to close the gap. Consequently, the deal will likely fall through because of lack of finance. What we can glean from this example, is that what is not lodged at the Land Registry simply does not exist legally to lenders and no money can be borrowed against it. Some extensions require a Licence of First Occupancy (LFO, for short) without which a property cannot be lived in or rented out. So, for example you cannot receive income letting it out as a holiday home. You may not be able to apply for utilities. As a result of not having attained a LFO, the property may not qualify to apply for utilities. Contact an architect to draft a building plan. File and pay for a town hall’s building licence (major or minor works). Attain a certificate of end of works. Register the extension/improvement in a deed at a Notary Public. Register the updated deed at the Land Registry. Registering extensions and improvements is in a property’s owners’ best interests as these will be made legal and will allow him to fetch a more attractive sales price for his property. Bottom line, for your own good, your Title Deed must reflect and match exactly your property’s description. If this is not the case, you must hire a lawyer to amend your Title Deed and adapt it to reality to legally sell your property or to apply for a loan against it. Lawyer Raymond Nesbitt explains what a Power of Attorney is, who needs it and how to get one. Article originally published at Spanish Property Insight: Power of Attorney Explained. Lawyer Raymond Nesbitt explains what a Spanish NIE number is, who needs it and how to get one. Get a NIE Number through us. What is a NIE number? This will be one of the first questions you will be asking yourself when you move on over to Spain. Succinctly, a NIE number is a tax identification number for foreigners which identifies you before the Spanish Tax Office and allows you to file and pay taxes in Spain. NIE stands for Número de Identificación de Extranjero. It is the counterpart of the NIF number which only applies to Spanish nationals. I have written up this brief Frequently Asked Questions to give a quick rundown on what it entails. You can request a NIE number service from our law firm. Justification on why it is needed. I take the opportunity to introduce a shameless commercial plug and advise that our law firm offers significant discounts when you apply through us for NIE numbers in bulk orders (three or more). So, the dire combination of costs ballooning coupled with all the red tape translated into a sharp dip in property sales at a time when Spain’s ailing economy sorely needed its property market to pick up. The ensuing public outcry was such that the Government came back into its senses and backpaddled on its new policy only months after introducing it. As a result of such a short-sighted policy, the economy had virtually grinded to a halt. You really couldn’t make it up. Article originally published at Spanish Property Insight: Spanish NIE Number Explained. *Our fees do not include mailing a NIE certificate. Larraín Nesbitt Lawyers is a law firm specialized in taxation, inheritance, conveyancing, and litigation. We do NOT answer questions over the phone on NIE Numbers. You can contact us by e-mail at info@larrainnesbitt.com, or by completing our contact form. Solicitor Raymundo Larraín Nesbitt takes us step-by-step through the legal procedure to buy new-build property in Spain from a developer. Continuing last month’s topic on Buying Property in Spain from a Private Seller (Resale Property), this month I provide a general overview on the full legal procedure on buying off-plan property from a developer (also known as new-build). The procedure to buy off-plan differs significantly from buying resale; to the point it warrants its own article as the pitfalls vary meaningfully from one another. I have simplified the procedure on purpose for ease of comprehension. If you are looking for more detail, I advise reading my article How to Buy Property in Spain Safely which gives an in-depth account of the full buying procedure. It is strongly advised you read this article in tandem with my article Buying Off-Plan Property in Spain. Bear in mind that you are paying a deposit on a property which under normal circumstances does not even exist yet and is unlikely to exist until a couple of years’ time. New-builds, unlike their key-ready resale counterparts, have an inherent element of risk associated to them. This risk is mitigated in the knowledge that new-builds are, in general, significantly cheaper than a resale property (on average by 30%). Moreover, as they are new, they are normally built catering to the highest quality standards and employing the most modern materials and know-how. This has a significant impact in insulation, for example, which may in turn impact your Town Hall tax bill by reducing it significantly (read pro-tips below). After making enquiries and looking around for a property you may have taken a liking to one. Off-plan properties are normally listed by developers or real estate agencies. They will nudge you to sign what is known as a reservation contract (or holding deposit) which strikes the new-build property off the market for a pre-agreed period of time; normally spanning 30 days. The deposit normally amounts from €3,000 to €6,000 depending on the property. The deposit contract is a succinct document that is normally only one page long. It has very few details, amongst them the developer´s name and company details, the development’s facilities, a general property description and the asking price. The reservation deposit will be deducted from the final sales price at completion (third stage, see below). It is strongly recommended that you hire an independent conveyance lawyer from the outset (prior to signing a deposit contract). Do NOT hire lawyers recommended by the developer; much less use his own lawyers no matter how reputable (even if free of charge). They are biased and will act only in the developer’s best interests, not your own - you will pay dearly on making this mistake. On following this simple, yet essential, advice buyers stand to sidestep most blunders on buying off-plan property in Spain. You should not pay any deposit unless the developer or estate agency have supplied you first with a copy of an approved Building Licence. The reason is because it could void the bank guarantees securing your stage payments; in plain English, you would lose all your money without any legal recourse. More details in my article Law 20/2015: Important new bank-guarantee legislation explained for offplan buyers. Reservation deposits are normally non-refundable unless expressly stated otherwise. You need to apply for a NIE number (Tax Identification Number for Foreigners). More details in my article: NIE Number Explained. You should open a non-resident bank account. Before the 30 days are up you will be expected to sign what is known as a Private Purchase Contract (or PPC for short). In Spanish, this is known as Contrato Privado de Compraventa. In English law we know it as Exchange of Contracts. The PPC will be a long legal contract which will list the buyer and seller´s personal details, a full property description, the agreed sales price, the schedule of stage payments, the buying terms and the time frame to complete before a Notary Public. Is the developer creditworthy? Construction track record? Does the developer own the land where the property will be built? Is there a valid Building Licence issued by a town hall? Are there any challenging planning issues overshadowing the development? Is the construction site compliant with Spain’s Coastal Law? Normally on signing a PPC you are expected to make a down payment equivalent to 10% of the purchase price which will be deducted upon completion (stage three). This amount of money is non-refundable. You will be expected to pay approximately 35% of the final sales price in stage payments. These are deducted at completion (stage three) from what you owe. All stage payments (including the initial reservation deposit mentioned in stage one) should be secured by what are known as bank guarantees. I simply cannot stress enough its importance. This document will be handed to you each time you make a stage payment and acts as a safety net on all the interim payments you make until the property is built. This safeguards your money in the event the development is not finished or should the developer file for bankruptcy. Attaining copies of bank guarantees is a top priority for your appointed conveyance lawyer. Remember to store safely a copy of all the stage payments you make into a Spanish bank as they will be required upon completion. You may also need them further on should you instigate legal proceedings. A developer cannot amend the agreed delivery date of a property worded in the PPC without your written authorisation. 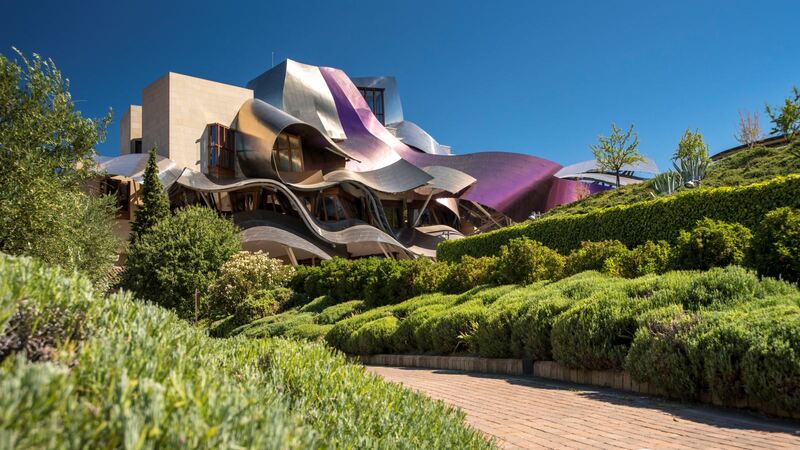 Photo credit: Otherworldly Hotel Marqués de Riscal amid vineyards, Valladolid, Spain. By Frank Gehry. One of the particularities of buying offplan property, is that completion normally takes place some two years after signing the PPC (stage two). The reason being is that the property is under construction and you only complete when it is finished. Completion is the term used to sign the Title Deed which is witnessed by a Notary Public. Additionally, if mortgage finance is required a second deed is signed called a Mortgage Deed. Completion is the time when you pay the balance that you owe, normally 50% of the sales price. You should read carefully through the deeds before you sign anything. This is particularly true of a Mortgage Deed. Your lawyer should ensure you do not sign abusive mortgage clauses. If you need a mortgage loan to complete on the property, it is highly advisable you negotiate a reasonable time frame to secure it i.e. 45 to 60 days. This is particularly true if a borrower is non-resident. A borrower requires an Offer in Principle (or Agreement in Principle) from his lender known as Oferta Vinculante in Spanish. At completion, you take legal possession of the property which is symbolized by being handed over the house keys. The developer’s legal representative and his lawyer. The bank´s representatives (if a mortgage loan is required). And finally, the Notary himself. Your lawyer will file and pay the buyer´s taxes and lodge under your name at the Land Registry your new Spanish property. Congratulations, you are now the official owner of a Spanish property. Enjoy! Primarily, you will not be able to take out a mortgage on the property or re-mortgage it – if needed be – by any lender other than the developer’s bank. You will not be able to benefit from the official utility supplies; only from the developer’s supplies (water and electricity) with all the associated problems this has, namely that you may be cut off at any time as it is the developer who is paying for it and if they go into receivership you will be shut off. Besides, the site supply electricity doesn’t have the same strength and power surges are fairly common on simultaneously turning on various electrical appliances such as air conditioning. Until the LFO is attained, the developer has to pay, by law, for the utility supplies. Any future prospective purchaser, or their lawyer, will haggle with you and require a steep discount if you lack a LFO. In a resale, the purchasers in turn will undergo the same problems to secure finance by means of a mortgage loan. A lack of a LFO tacitly implies that you are actually reducing the pool of potential purchasers for your resale. If there are Planning issues, the town hall can set a charge against the property and you, as the new owner of an off-plan and not the developer, may be held liable to pay the fine for the planning illegality. Needless to say, you cannot (legally) rent a dwelling without a LFO. It is strongly recommended you hire a chartered surveyor to carry out a snagging list of the property; this is particularly true of new-build properties. The time to detect and mend all outstanding construction flaws is before you complete at the Notary. Once you complete, you lose your leverage unless your lawyer has practiced a retention. Commissioning a comprehensive snagging report avoids countless problems and is worth every penny in my experience. Failure to secure a mortgage loan in time may result in the loss of the 10% deposit. The developer will always offer a buyer to subrogate himself in his position taking on the developer´s mortgage loan. This may not be always beneficial for a buyer. It goes against a buyer´s best interests to under-declare part of the sales price at completion (besides being illegal). More on why in my article Taxes on Selling Spanish Property. You should immediately replace all the locks of your new property (including storage rooms) as countless people have had access to copies of your home keys during the construction phase. This avoids thefts and break ins during the first months. Request an Energy Performance Certificate from the developer prior to completion. Properties with high energy efficiency ratings qualify for tax rebates of up to 20% on their local Town Hall tax (i.e. IBI tax). Photo credit: Fallingwater (Kaufmann Residence) by Frank Lloyd Wright. Rubbish collection tax. Paid twice or once a year depending on the town hall. IBI tax. Paid annually (akin to the UK’s Council tax). I strongly urge this tax is set up as a direct debit; failure to pay it may lead the authorities to auction off your property in a procedure which is surprisingly expedient – as in months. Whoever is the owner of a property on the 1st of January of the current year is liable to pay for this tax. On owning property in Spain, it is strongly recommended you make a Spanish will. This avoids your heirs a number of problems down the line. You should set as a direct debit utilities and local taxes. On owning property, you should appoint fiscal representation to comply with your annual Non-Resident taxes. If you plan to rent out your property as a private holiday rental some regions have stringent laws on the matter – seek legal advice. Some regions require you to apply for a rental licence or that you register your holiday rental home. Non-compliance may attract humongous fines. IBI tax is not normally available to pay until one or two years after completion. However, you will be expected to pay all the backdated taxes since you completed. As a rule of thumb purchase costs add 10 – 15% over and above the purchase price. In some regions of Spain, particularly in Valencia, this figure may be higher. Please take thorough legal advice to budget your purchase before you commit. You can read my article Taxes on Buying Spanish Property for more details. Value Added Tax (IVA, in Spanish): 10%. Storage rooms (trastero) and car parks (plaza de garaje) sold individually and legally separate from the main dwelling have a VAT of 21%. Hiring a seasoned lawyer, in my experience, pays for itself on all the money you stand to save on avoiding the most common pitfalls on buying a property in Spain. Make sure you are assisted on your house-hunting by reputable experts (such as a long-established real estate agency, a reliable mortgage broker or a seasoned lawyer) to benefit most from the wide range of available bargains – you will be spoilt for choice. It is important you avoid being pressurized into completing; take your time to fully assess the information you are being given and do not hesitate to ask any questions. And to close, I stress draconianly not to complete without a Licence of First Occupation. “Your best work is your expression of yourself.” – Frank Gehry. Frank Owen Gehry is a Canadian-American architect who won the Pritzker Prize in 1989. He is known for his buildings such as 8 Spruce Street, Dancing House, Port Olímpic, Jay Pritzker Pavilion, the Hotel Marqués de Riscal and the Guggenheim Museum in Bilbao, Spain. He built buildings across the United States and across South America. Also published at Spanish Property Insight: Buying Property in Spain from a Developer (Off-Plan Property). Larraín Nesbitt Lawyers is a law firm specialized in taxation, inheritance, conveyancing, and litigation. Please contact us for a free initial consultation. You can contact us by e-mail at info@larrainnesbitt.com, by telephone on 951 894 675 or by completing our contact form. Solicitor Raymundo Larraín Nesbitt takes us step-by-step through the legal procedure to buy property in Spain from a private vendor, also known as For Sale By Owner (FSBO). The purpose of this article is to provide a general overview on the full legal procedure when you buy resale property from a private individual. I leave for another article the procedure to buy property from developers (known as off-plan or new-build property). If you are buying rural property, make sure you hire a lawyer before you sign any document! Be advised rural property is a minefield in Spain. It is strongly advised you read this article in tandem with my article Buying Resale Property in Spain. After making enquiries and looking around for a resale property you may have taken a liking to one. Properties are normally listed by real estate agencies. The real estate agency that has the property listed in its books will prod you to sign what is known as a reservation contract (or holding deposit) which strikes the property off the market for a pre-agreed period of time; normally spanning 30 days. The deposit normally amounts from €3,000 to €6,000 depending on the property. The deposit contract is a succinct document that is normally only one page long. It has very few details, amongst them the property and seller´s details and the asking price. It is strongly advised you hire an independent conveyance lawyer from the outset (prior to signing a deposit contract). On following this simple yet essential advice buyers stand to sidestep most blunders on buying property in Spain. An agency´s reservation deposit should at no time list who pays what taxes and set out other conditions. This is agreed by the parties in stage two (Private Purchase Contract). Request an Energy Performance Certificate from the estate agency. Properties with high energy efficiency ratings qualify for tax rebates of up to 20% on their local tax (IBI tax). It is strongly recommended you hire a chartered surveyor to carry out a snagging list of the property; this is particularly true of older properties. If you are buying rural property commissioning a surveyor's report beforehand is simply essential. This will avoid countless problems. Before the 30 days are up you will be expected to sign what is known as a Private Purchase Contract (or PPC for short). In Spanish, this is known as Contrato Privado de Compraventa. The PPC will be a long legal contract which will list the buyer and seller´s personal details, a full property description, the agreed sales price, the buying terms and the time frame to complete before a Notary Public. Your lawyer will have normally already supplied you with a report on title so you are perfectly aware of the legal situation of the property you want to buy before signing the private agreement. Normally on signing a PPC you are expected to make a down payment equivalent to 10% of the purchase price which will be deducted upon completion (stage three). This amount of money is non-refundable. If you need a mortgage loan to complete on the property, it is highly advisable you negotiate a reasonable time frame to secure it i.e. 45 to 60 days. This is particularly true if the borrower is non-resident. A borrower requires an Offer in Principle (or Agreement in Principle) from his lender known as Oferta Vinculante in Spanish. If movables are being sold along the property it is highly advisable an inventory is added to the PPC. This inventory should be drawn up in great detail to avoid misunderstandings. This inventory will likewise be added to the Title Deed at the Notary Public on completion. It is regarded as a contractual element which binds both parties. If the seller does not include something from within, it will be regarded as a breach of contract. The inventory is normally drafted by the estate agency. Failure to secure a mortgage loan in time may result in the loss of the 10% deposit. It movables are being sold along the property, it is crucial the inventory is detailed and accurate. You may even consider adding photographs of the items listed. Completion is the term used to sign the Title Deed which is witnessed by a Notary Public. Additionally, if mortgage finance is required a second deed is signed called a Mortgage Deed. The seller and/or his lawyer. The bank representatives (if a mortgage loan is required). Never agree to a seller staying in the property post-completion even if it’s just for a “short time”. This can create massive legal problems for a buyer which will require a full eviction procedure. Resale buyers should be mindful of La Complementaria or Bargain-Hunter tax. Property Transfer Tax (or ITP in Spanish) which varies, depending on the Autonomous Community where the property is located, between 7 to 10%. “Buy land, they’re not making it anymore.” – Mark Twain. American writer, entrepreneur, publisher and lecturer. Among his novels are The Adventures of Tom Sawyer and its sequel, Adventures of Huckleberry Finn. Also published at Spanish Property Insight: Buying Property in Spain from a Private Seller (Resale Property).